Wyker Dampfschiffs-Reederei Föhr-Amrum GmbH was established in 1885 and is among Germany’s leading domestic and island ferry service operators, linking the islands of Föhr and Amrum, plus the islets of Hooge and Nordmarsch-Langeness, to the mainland ports of Dagebüll and Schlüttsiel in the Schleswig-Holstein region of Germany on the country’s North Sea coast. 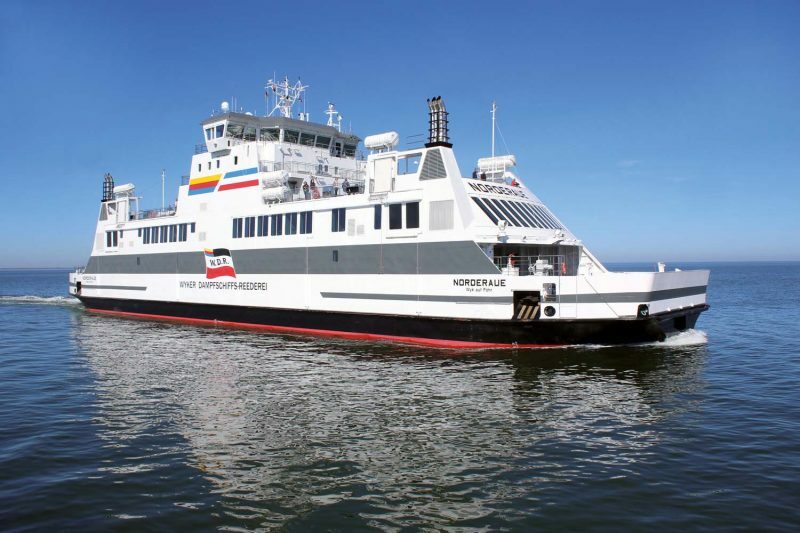 Five ferries operate on two routes, namely Dagebüll-Wyk (Föhr)-Wittdün (Amrum) and Schlüttsiel-Hooge-Langeness-Wittdün (Amrum). W.D.R. also operates public transport services on the Islands of Föhr and Amrum, with all services provided without public subsidies. The origins of today’s ferry traffic can be traced back to the 17th century. Since 1662 regular sea connections between the mainland and the islands of Föhr and Amrum have been provided. From the mid-1830s these services began to grow in popularity as the popularity of the seaside resort of Wyk increased. In 1872, the then Wyker Fährgenossenschaft opened its first service between Wyk and Dagebüll with the steam vessel Föhr Et Dagebüll. The W.D.R. was born on 14th March 1885 when 33 citizens met at the Redlefsen’s Hotel in Wyk to conclude the founding of the Wyker Rhederei-Gesellschaft. The company’s first new ship, the Nordfriesland, went into service for the summer season of 1886. Initially the ship sailed several times a week to the larger island of Sylt but was mainly employed to ferry traffic to the mainland port of Dagebüll, Schleswig-Holstein. Due to the success of the new operator, rival Föhrer Steamship Company went into liquidation in 1889 after the other competitor, Wyker Fährgenossenschaft, had been taken over after just 6 months. The company now changed its name to Wyker Steamship Rhederei-Gesellschaft mit Beschränkter Haftung as sole operator to Föhr. Another company also ran services to Amrum but they ceased in 1971. In 1908 the W.D.R. introduced their new flagship, the Föhr-Amrum. This 211grt ship was able to carry 470 passengers. Nineteen years later the 285grt/740 passenger capacity Nordfriesland was introduced and she boasted a foredeck capable of conveying a car (yes, 1 vehicle) as the era of the motorcar was dawning. The vessel was later converted to carry four cars. Most were craned aboard but wooden planks were also used to drive vehicles on and off when tidal conditions permitted. Despite this new possibility, driving to Föhr and Amrum remained the exception even in the 1930s. For example, throughout 1932 only 36 cars were transported. The Second World War took a heavy toll on the region but in the 1950s the rejuvenation began. In 1954 a record 2,000 cars were carried to Föhr and Amrum and a fleet renewal got underway. The Ro-Ro age arrived in 1962 when the new 41.60m long vessel Pidder Lyng entered service with capacity for 36 cars and 200 passengers. Today’s W.D.R. was formed in 1971 when the company merged with Amrumer Schiffahrts-AG (ASAG) that had been founded in 1960. ASAG’s 1968 built Ro-Ro vessel Amrum thus joined the W.D.R fleet and could accommodate 20 cars and 481 passengers. She remained operational until 1991. Dagebüll’s port and approaches underwent dredging in the 1970s to provide a ferry service at all tidal states. Between the early 1970s and mid-1990s W.D.R introduced various newbuildings, the last of which being the 2,287gt/1995 built Nordfriesland. A record year for carryings was 1992 when over 2.25 million passengers and 300,000 cars were carried. The W.D.R employs around 160 members of staff and functions as a private-sector company controlled by 315 shareholders, including another German ferry operator, AG Reederei Norden-Frisia, which is the largest single shareholder. The city of Wyk auf Föhr, a former majority shareholder, now holds 31.9% of the W.D.R. The German built Ro-Ro is our featured ship this month.